2. All resistance tests should be preformed with your Cabrio washing machine unplugged from the wall outlet and any wiring to the component disconnected. 3. The most common cause of any Cabrio washer control failure is corrosion on the connectors. Always check for a good electrical connection first! 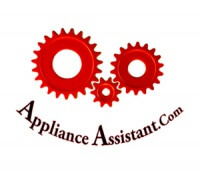 Also look for broken or looses wires, bad terminals, or wires not pressed onto connectors far enough before replacing any Cabrio washing machine parts. Like most electronically controlled appliances, Whirlpool Cabrio washing machines use a part called the user interface which is a thin panel of switches placed directly behind the skin of the washer’s control console and also a switch called the encoder that identifies the position of the rotary cycle selection knob. The relationship between the Cabrio washer’s user interface, encoder, and the control board are so close it can sometimes be difficult to determine which parts is responsible for programming problems, fortunately diagnostic tests built into this style of washer can be used to help identify the troublesome washer part for it’s quick removal and replacement. Cabrio washing machines use a control board to process commands entered into the user interface and send the proper amount of electricity to a particular washer component at the correct time to perform some function, such as opening a particular water valve solenoid, operating the motor, energizing the recirculation pump, drain pump or lid lock. If the washing machine were a body the control board is the brain behind all of the washer’s operations. The Cabrio control board is also used to interpret information being sent from various sensors in the washing machine, like the inlet/ dispenser valve thermostat or the motor’s Rotary Positioning Sensor (RPS). Most problems that occur with the Whirlpool Cabrio washing machines are control board related. However, you never want to replace the control board without first checking all other possibilities through the diagnostic testing process. As the water level rises, air pressure inside the Cabrio’s pressure switch tube increases because of the water’s weight. When the desired water level is reached, the pressure switch inside the Cabrio washer’s control board cuts electricity to the water valves and turns on the recirculation pump, for the wash portion of the cycle. Any pinching or holes in this pressure tube and the pressure sensor will not be able to detect the Cabrio’s water level. This will cause the washer to stop and display an error code such as LF, which means “Long Fill” or other error codes. You can also calibrate the water level sensor through the manual diagnostic mode. The lid lock on Cabrio washing machines is a two-part mechanism. 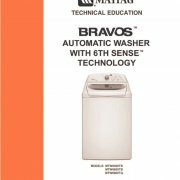 It has a magnetic switch that senses when the lid is in the closed position; it also has a locking tab that must be extended in the locked position to allow the washer to continue with any of its washing functions. The lid lock is responsible for three possible error codes: “dU” (Door/Lid cannot unlock), “dL” (Door/Lid cannot lock) and “lid“(Lid Opened) The lid lock can be checked for resistance in it’s various states with a voltmeter at the washing machine control board. 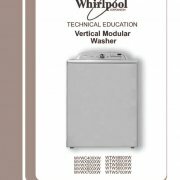 The Whirlpool Cabrio water supply valve is a very large assembly of six solenoids that direct water through the detergent, bleach, and fabric softener dispensing cups as well as directly into the washer’s tub through the “fresh fill” inlet valve. The valve assembly also contains an Auto Temperature Control “ATC” thermostat that detects water temperature and adjusts the amount of hot or cold water entering the tub for optimum energy efficiency and detergent performance. Even though the water inlet/ dispenser valve assembly on the Cabrio washing machines looks complicated it is actually a fairly simple mechanism that is rare to fail. 3. The imbedded thermostat or “ATC” fails to properly detect water temperatures flowing through the valve assembly, giving the control board a false reading. The drive motor on the Whirlpool Cabrio washing machines is two part system made of a stator which generates a rotating magnetic field and a rotor with strong permanent magnets embedded around it’s inner wall allowing it to levitate over the stator. When the control board energizes the fixed position stator the rotor begins to rotate, attempting to equalize in the moving magnetic field. This style of motor operates with almost zero mechanical friction, and can accelerate, stop, and reverse direction faster than you can say, “mama needs a new washer”. 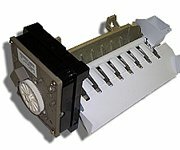 The Rotary Position Sensor or “RPS” monitors the motor’s direction and rotation speed, then relays the information to the washer’s control board. This is an extremely reliable motor design and most problems that happen are control related. Some of the first Cabrio washers had an invisible coating on the motor’s RPS connection remaining from production that would block communication from the RPS to the control board causing RPS related error codes. Unplugging and reconnecting the RPS connection plug several times to clean off the coating for better contact would easily fix the problem. To test the motor windings for resistance disconnect the wire connector from the drive motor terminals, and measure across any two of the three drive motor terminals. Resistance should be about 16 Ω for each one of the three stator motor coils. You can also measure from the wires connected to the P5 terminal of the washing machines control board. Note: if an abnormal reading is measured from the P5 control board of the washing machine be sure to test the motor directly before drawing a conclusion, this will eliminate the wiring harness as a possible problem. Impeller Definition: The rotating part or a pump, compressor, or other machine designed to move fluid by rotation. Agitator Definition: An apparatus for stirring liquid. Note: The Impeller or agitator can be removed from the washing machine by pulling the top cap off of the impeller or agitator and removing the 7/16″ bolt that is hidden underneath. This will allow you to examine and replace the agitator roller cams or lift the inner wash basket out to access the outer tub, tub sump, and lint filter for cleaning. The recirculation pump is the key to the Whirlpool Cabrio water sipping efficiency. Instead of completely filling the washing machine’s tub like most top loading washing machines, only enough water is added to cover the washer’s wash plate and float the inner tub allowing it to lift off the basket hub. Once the washing machine has finished adding water to the washtub the recirculation pump jumps into action recycling wash water back on top of the clothing. The recirculation pump is located at the left rear of the washing machine mounted directly to the outer washtub with three 5/16″ hex-head screws. Like all washing machines it is important to check your pockets for loose change and put smaller items such as baby socks and lingerie into a mesh laundry bag to keep them from finding their way into the washer’s recirculation pump or drain pump. Note: Don’t wash floor rugs with rubber backing in your fancy washing machine! If the recirculation pump motor becomes clogged it can often be cleared of the object and reinstalled. However, motor damage can occur if the motor is allowed to operate that way for a long period of time. 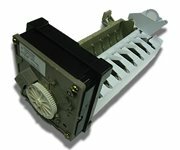 The pump motor windings should have a resistance value between 30-38 Ω and can be tested for resistance directly at the pump or by testing the wires connected to the pump after disconnecting them from the P4 connection on the washer’s control board. Note: if a resistance problem is detected at the P4 control board connection, be sure to check the recirculation pump directly before ordering a new pump, this will eliminate possible problems with the wiring harness. Also be sure to check all of the connected hoses and the tub sump area for blockages. Note: The Recirculation pump can be manually tested with the diagnostic tests. The Drain pump of a Whirlpool Cabrio washing machine is essentially the same as the recirculation pump except it’s purpose is to remove dirty wash water from the washing machine’s tub and send it packing down stream. Because the water level is being monitored by the pressure sensor built into the washing machine’s control board, if the washer takes to long to drain an “Ld” meaning “Long Drain” error code will appear on the washer’s display. Another common drain related error code is “Sd” meaning “Suds Detection” (For more information about troubleshooting these error codes click on the code link) Like all washing machines it is important to check your pockets for loose change and put smaller items such as baby socks and lingerie into a mesh laundry bag to keep them from finding their way into the drain pump or recirculation pump. Like most washing machines the Whirlpool Cabrio have two tubs, an outer tub to contain the wash water and an inner tub or “basket” that contains the articles to be washed. Most washing machines have an inner basket that is directly attached to the drive system at all times. With the Cabrio washing machines this is not the case. As the water level inside the washing machine rises the inner tub will float, lifting it up and off of a part called the “basket hub”.When this happens the inner tub is centered by the drive shaft but is allowed to turn freely in both the clockwise and counterclockwise directions. Because the inner basket is free floating it will tend to rotate with the water and clothing it contains which the agitator or impeller is turning. This catch up then slow down movement creates an additional wash action used to free dirt from clothing. The suspension system on the Cabrio washing machines is about as simple as it gets. The outer tub is suspended on four spring-loaded suspension rods. This design enables the washer tub to absorb a great deal of vibration and shock by using the weight of the tub as a counterbalance. This engineering concept was developed by the Japanese thousands of years ago to protect their temples and pagodas from earthquake damage by absorbing the earth’s movement. “Bend like the reed or break like the oak.” It has also been recently used in modern skyscrapers for the same purpose. 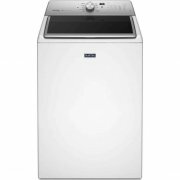 (Because these washing machines have an extremely fast final spin, out of balance loads are a common complaint, and most often the result of user error. Early versions of this washer style had a problem with the tub suspension springs. In later versions a top receiver cup was added to the suspension rod kit to allow for easier movement at the top mounting point on the washing machine’s frame. Consistent out of balance loads can often be corrected by replacing the suspension kit with the new suspension kit part #W10189077. I have a cabrio 6400 and it’s doing some weird things. In any of the wash choices, it’s starts fine, then at some point it ends with an overload error, regardless of what’s in it, and clothes are dripping wet. If I then choose the drain and spin option, it spins fine and clothes come out ready for the dryer. I tried the auto diagnostic. It goes from C1 to C2, but C2 just fills the basket to almost the very top then the machine shuts off. Midway through C2 if I hit the start button, it will continue through the diags. No fault codes are reported. As far as C2 goes, I don’t see anything happen with the inner basket floating, whatever that means. It just stays in place as it always does. I suppose this is part of the problem. Is there something I can do to somehow free the basket to do what it’s supposed to do? The dials say to look for the cause of basket binding, but I don’t see how that’s done. Sorry, I meant C0 to C1, not C1 to C2. Its C1 where I’m having the problem happen. Question, I removed the inner tub of the Cabrio to clear out socks between the two tubs. But now I am unable to get the inner tub far enough down the shaft to set it in the correct place. Any ideas how this is done? There are two repair manuals listed for a Whirlpool Cabrio Washer. I would like to order one for download, but was confused as to which. The model number I need one for is WTW7800XW0. Any help would be appreciated. I need to replace the bearings and did find your tech bulitin covering that issue. Also, the paper on nunning the diagnostics and error code summary was helpful. How about a me asking the Question?? All I’m trying to do is fix a leaking hose I suspect. Water leaks from somewhere around the fabric softener tray. Either the tube into the tub is stopped up and water overflows down the outside or there is a water supply tube that rinses the softener tray that has a leak in it. How do I get to that area to find the actual source of the problem? Thanks for the question! Sorry for my slow response. I have had quite a few of these washers with that problem… In some cases something has found its way into the dispenser that is slowing the water from leaving the cup into the washer so it over flows and leaks onto the floor. In other cases the water valve over pressurizes the dispenser and has the same overflow effect. lastly there may be a leak in the supply hose to the cup. The first thing to try is to close the water supply valves to the washer half way to reduce the pressure, if that stops it you likely need to replace the washer’s water valve for a more permanent fix. if you would like help with lifting the top I will need the full model number.